The great majority of those who have translated Exodus 3:14 have agreed on at least one point, which is that the Hebrew word ehyeh, which features three times in this verse and is the cause of all the perplexity that attends upon it, derives from the verb root hayah meaning ‘to be’. This single point of agreement is also where the consensus all but ends. It is often said that every translation is an interpretation, and in the case of a cryptic combination of words that each have more than one meaning and possible translation this is all the more true, as the following will demonstrate. Among the most important of the early translations of the Hebrew Bible, the earliest Jewish translation was undertaken in the third century BCE with the writing of the Greek Septuagint. This was followed in the first to second centuries CE by the Greek versions of the Jewish Aquila and Theodotion and in the early fifth century CE by the Latin Vulgate of the Christian Jerome. The Septuagint translates ehyeh asher ehyeh of Exodus 3:14a into Greek as “ego eimi ho on”, which in turn translates into English as “I am the one who is”, and it translates the absolute ehyeh of 3:14b as “ho on”, “the one who is”. This earliest of all translations of the Hebrew thus associates the revelation of Exodus 3:14 with the concept of absolute existence. It is especially noteworthy by virtue of being, to this day, one of the very few translations to interpret ehyeh asher ehyeh as God’s Self-identification to Moses. It is also the first of many to recognise the absolute ehyeh as the Divine name in the verse. However, the Septuagint translation of the verse cannot be an exact rendering of the Hebrew because neither the form of words nor the actual words of the Greek translation allow for that possibility. The versions of Aquila and Theodotion have ehyeh asher ehyeh and the ehyeh of 3:14b rendered into Greek as “esomai hos esomai” and “esomai” respectively, which in turn translate as “I will be who I will be” and “I will be”. There could have been several reasons why they chose to translate the words of Exodus 3:14 in this way, but among them would certainly have been a desire to produce a translation that would be more true to the Hebrew original than the Septuagint. For this reason they would have wanted to restore the idem-per-idem form of ehyeh-asher-ehyeh, and so this is what they did. However, had the translators’ only purpose been to restore the idem-per-idem form, then the most obvious revision of ego eimi ho on would have been ego eimi ho ego eimi, which would at least have preserved the only literal translation of ehyeh that does feature in the Septuagint version of the verse (ego eimi). Instead, they chose to replace the words “ego eimi” with “esomai”, which is to replace the words “I am” with “I will be”, and, in keeping with the apparent intention of the Hebrew text, they translated all three occurrences of ehyeh in this way. With this translation Aquila and Theodotion gave an entirely different meaning to Exodus 3:14, and brought to it most notably the connotation of temporal existence in place of the absolute existence connoted by the Septuagint version of the verse. As for the meaning their translations convey, there is no suggestion that ehyeh asher ehyeh is God’s Self-identification to Moses as it is in the Septuagint and no clear indication that the absolute ehyeh is understood to be the Divine name in the verse. The Vulgate of Jerome was clearly influenced by the Septuagint because it corresponds closely to it in its Latin translation of ehyeh asher ehyeh and ehyeh as “ego sum qui sum” and “qui est” respectively, which in turn translate into English as “I am who am” and “He who is”. Like the Septuagint, this translation clearly connotes the concept of absolute existence. Also like the Septuagint, it interprets ehyeh asher ehyeh as God’s Self-identification to Moses and it identifies the absolute ehyeh as the name in the verse, one that continues to be recognised as a Divine name in Christianity to this day (see Exodus 3:14 in Christianity). However, also like the Septuagint, both the form of words in 3:14a and the actual words of 3:14a and 3:14b rule them out as a true translation of the Hebrew. From the above it will already be clear that this verse has long presented a considerable challenge to translators and interpreters alike. 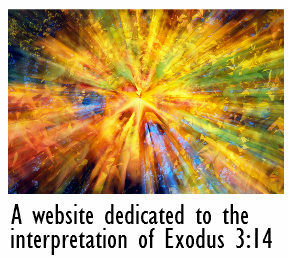 However, if we set aside the implausible suggestions that God is being evasive, deliberately obscure or even dismissive in His response to Moses, then it can be seen that over the course of the centuries following the writing of the Septuagint, the debate over the interpretation of Exodus 3:14 came to a focus on just one question. Does the word ehyeh as it occurs in this verse refer to God in the sense of His absolute and eternal existence or does it refer to Him in relation to His actions in space and time and so to temporal existence? In one guise or another this is the question that has dominated interpretations of the verse down to the present day. What follows is the story of Exodus 3:14 in Judaism as it has unfolded over the course of the last two thousand years and as related by a representative sample of the most important and influential Jewish translators and interpreters of that epoch. Its main purpose is to inform the reader of the religious, theological and philosophical context within which Part II of this paper can best be appreciated. It is not intended to be either comprehensive or detailed, but only to represent the full range and depth of Jewish interpretations of the verse and to highlight the reasons why none of the interpretations thus far have been convincing. It is comprised of a review of Jewish translations and interpretations of Exodus 3:14 presented under six headings: Jewish Bible Translations, The Talmud and Midrash, Medieval Jewish Thought, Kabbalah, Modern Jewish Philosophy and Contemporary Jewish Interpretation.